Cottage in affitto durante il week end, settimane o mesi. Zona tranquilla, senza rumore e vicini di casa. Un cottage, con 2 camere matrimoniali, 1 bagno con doccia, WC, lavabo, 1 bagno con wc e lavabo, soggiorno con camino, sala da pranzo e cucina. La cucina è attrezzata con fornelli a gas e frigorifero forno e gas. L'elettricità è generata da pannelli solari. Piscina di 6 metri per 3 metri. Un posto tranquillo in 4 ettari di alberi e prati. 2 km dal villaggio di Crespià, a 32 km dalla Costa Brava, a 15 km da Banyoles e 13 km dal borgo medievale di Besalú. La casa tiene todos los servicios. Piscina muy grande. Está en pleno bosque y cerca de pueblos y ciudades de interés turístico. Los propietarios muy amables y serviciales. Great remote location, hosts were fantastic even producing a couple of wonderful tortillas which went down very well with the vegetarians in the group. The free standing pool was more than adequate and the peace and quiet blissful. The owners clearly love the area and are on hand if required but give you your privacy. The only minor negative is that the bedrooms could have done with a couple of fans, the evenings were very warm. We kept the shutters closed during the day and then opened everything up in the evening, leaving just the mosquito mesh in place but there was no air-flow. We received this review with pleasure firstly because we were happy that they had enjoyed their stay with us but also for their observations about fans for the bedrooms. I now realize that during the months of July and August electric fans in the bedrooms will increase the comfort of future guests. Really quiet peacefully located cottage. It is in the middle of nature. The garden (or wood) is large (not fenced). Girona is closeby, but there are also other villages around Crespia to discover. We brought our dog and she enjoyed it. She could run around, play with the 2 dogs from the owners, we could easily walk out with her for short and long walks in nature and up to the river for a swim. The owners are good hosts, they are closeby if you need them, but leave you very private. We stayed at this lovely place for four days and wished we could have spent more time there. Our two young sons had a great time exploring the meadows and woods surrounding the cottage. There are plenty of places to sit outside either in the sunshine or in the shade of the trees. 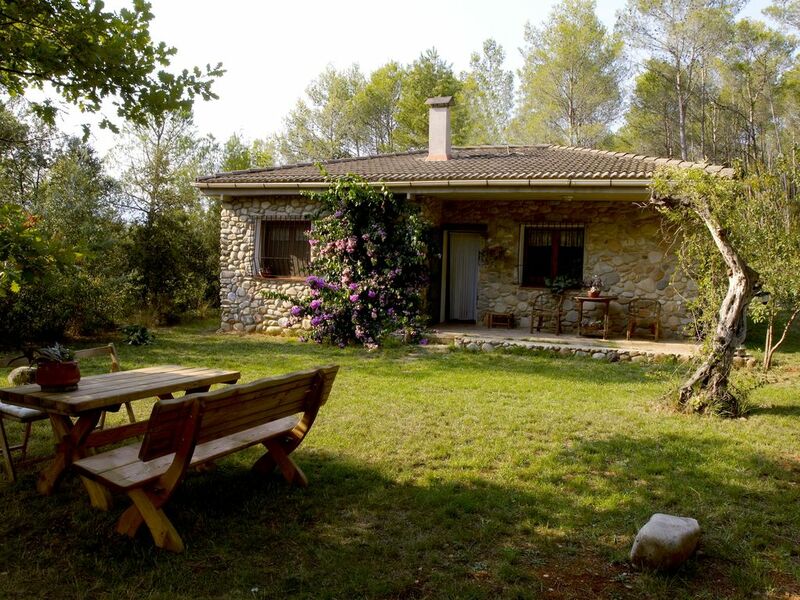 The traditional Catalan style cottage was spacious and comfortable, We especially liked the evening fires as it was cool at this time of year. Our family. As there was no noise pollution our family slept very well. The location of the cottage was suitable for reaching the major points of interest by car. Terry and Gloria were good hosts and we certainly appreciated the warm, home baked pastries ! ( Fresh eggs, and fruit as well ! ) Their dogs, Black and Jack were rambunctious and very friendly. It was apleasure to experience this quiet and relaxing abode. Thank you Terry and Gloria. Un posto tranquillo in 4 ettari di alberi e prati. 2 km dal villaggio di Crespià, a 32 km dalla Costa Brava, a 10 km da Banyoles e 13 km dal borgo medievale di Besalú. On low season you can also rent at Weekend nightly rate of 100 euros and minimum stay of 2 nights. Booking on Friday night and checking out on Sunday.